The Clinch County School System Governing Board is comprised of five members who are elected by the voters of Clinch County. 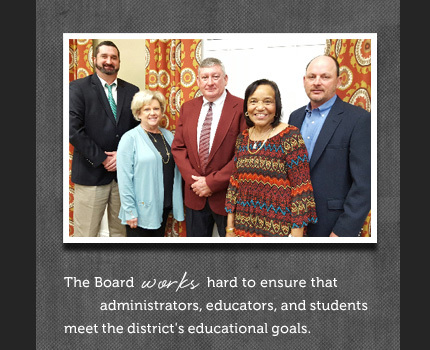 The Board works hard to ensure that administrators, educators, and students meet the district's educational goals. They volunteer their time to set district policy, encourage parent involvement, and hire and retain quality staff. We hold board meetings on the third Thursday of each month. Please feel free to download our 2018-2019 board meeting calendar. Did you miss a board meeting? Please visit our eBoard page for agendas and minutes.